Wait, the front page can be updated? Preposterous hogwash. 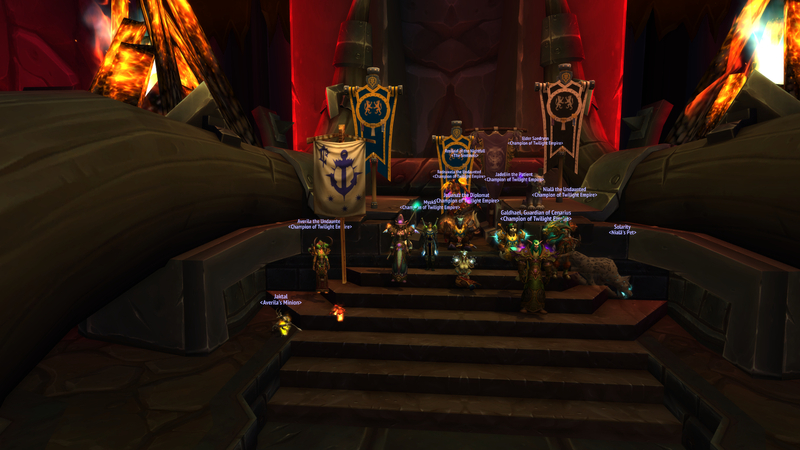 Congratulations to Raid Group 2 for finally bringing down Garrosh Hellscream! And then taking pictures for half an hour. Style is just as important as winning, you know. Aerana I'm so behind the times! Congratulations to all of you! Welcome to the new guild site! So, as some of you know, Wowstead is closing down its doors. It will be transferring our site data to a new site on GuildLaunch. However, the officers have been shopping around a bit and we have settled on Enjin to be our new home. We feel this will allow us more features at a better price. I'm sure you will enjoy our new home, and I expect to find some of you in the chatroom killing the time on occasion. However, there is an important caveat: any forum posts on the Wowstead site will have to be moved over manually. As this is a colossal task (and as not every thread on the forums is worth moving over), we will leave it in your hands to take the threads that you want to see moved to the new site and to move them over to our new forums. The other threads won't be lost, however! Since our forums will be moved over to GuildLaunch, all our old posts will still be there for reading and nostalgia, and a link to this 'Archive' will be available from within the new forums. Over the next week or so, we will be tweaking stuff and making sure that the site is running to everyone's satisfaction. Make sure to let me know if you'd like more features, or if you experience any problems with the site.